It pains me to tell you this, but the US might be waiting even longer for Europe's much-loved Spotify. They've missed two deadlines already, and with their end-of-year launch date looming, it's not looking good for free music lovers. If you missed me raving on about Spotify the other month, do check out the post here. The free desktop client streams your chosen tracks and playlists automatically, and if you pay a bit per month you can also get offline play, a mobile app, and removal of advertising. It seems, however, that no matter the demand for the service in the States, they still haven't yet signed Universal, Warner, EMI and Sony—the four largest key-keepers to most of the world's sought-after music. Naturally talks have been taking place—and will continue taking place—but supposedly the labels are asking for large royalty fees, so concerned they are of the "free" aspect of the service. Unsurprisingly, there's also Apple to contend with, too. They obviously have close relationships with all the majors, and would rightly be concerned about a truly free business model launching—and succeeding—in the States. I'm not suggesting they'd attempt to block Spotify's chances, but there have been so many rumors of a cloud-based iTunes that they must be worried. In fact, the NY Post (hardly credible, but stay with me here) seems to have heard from sources that Apple's subscription service could cost between $10 - $15 a month, depending on how large a slice from the music pie someone wants. 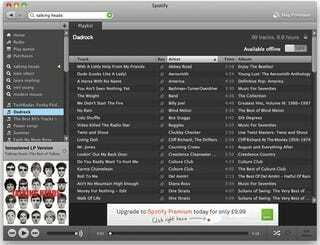 Spotify, on the other hand, allows for 20 hours of free streaming a month, but for only £5 a month ($7.90) it's unlimited.